Some of the highest peaks in New Mexico are found near Angel Fire, 24 miles east of Taos on N.M. 34. Known for its snowcapped mountains and breathtaking views, it’s no wonder Angel Fire is a popular destination for mountain bikers, skiers, and snowboarders. But you can also experience the area’s scenic beauty on a cozy sleigh ride. Dashing through the snow, sleigh rides offer a chance to truly soak up the winter landscapes. In winter months, Angel Fire–based Roadrunner Tours offers four excursions daily winding through the spruce- and aspen-filled Carson National Forest and overlooking the Angel Fire Resort. Hour-long afternoon excursions take you into the wilderness, where you stop at warming tents for homemade hot cocoa. A two-hour evening excursion follows the same route but stops for a scrumptious dinner of rib-eye steak, baked beans, and cookies—or whatever else the chuckwagon cook has whipped up. Reindeer might not draw this sleigh, but two powerful draft horses pull up to eight passengers through the glistening meadows. You’ll be able to snap pictures of the peaceful surrounding forest and enjoy the blanket of snow around you. Sleigh tours usually begin the week before Christmas and run through March, depending on snowfall. 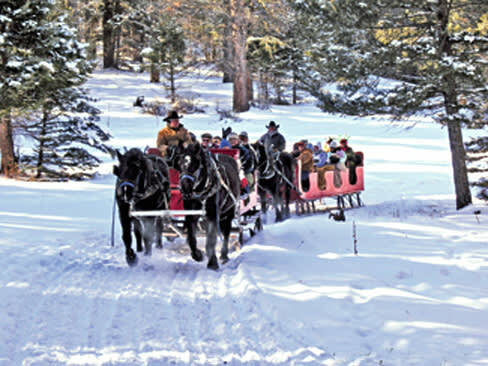 Many families make sleigh rides an annual holiday tradition; reservations are recommended. “I’ve met a lot of good people on the sleigh,” Burch says. James Sewell, the rink’s namesake, established the popular skating locale in the 1960s, when he filled a low spot in town with water and let it freeze overnight. Year after year, Sewell continued to spread holiday cheer, and locals and tourists have capitalized on it ever since. During your visit, you can also snuggle with loved ones in the warming hut while sipping hot cocoa—or buy graham crackers, marshmallows, and chocolate from the snack bar, then roast s’mores over an open fire. “When you’re skating outdoors, you’re surrounded by the park and there’s snow everywhere,” Willett says. “It’s a time to be with your families and enjoy each other’s company. It’s the perfect holiday experience.”—B.C. • The James Sewell Ice Rink is frozen over mid-December through the beginning of March. Picture this: Three inner-tubing lanes twisting down 1,000 feet of groomed, snow-covered slopes. You and a buddy climb aboard a double tube and then, in seconds, slide—screaming and laughing—all the way to the bottom. A moving carpet—the mountain version of an airport people mover—whisks you back to the top for a repeat thrill ride. Now: Imagine all this in the dark. The Polar Coaster, Angel Fire Resort’s tubing venue, is no figment of your imagination: It’s open daily in winter, and offers tubing until 8:30 p.m. under stadium night lights. To take full advantage of the fun, don’t forget your glow sticks and reflective clothing. Angel Fire Resort is located 24 miles east of Taos, off U.S. 64/N.M. 38 and N.M. 434. Unlike many winter sports, the tubing experience isn’t limited by strength or skill level. You can descend at your preferred speed, cruising through as many twists and turns as you choose. The Wonder Carpet, a 670-foot tow belt, takes everyone—including grandparents and children—from the base to the top of the run. • Reservations for tubing at Angel Fire Resort are made for 90-minute blocks, and during peak periods should be booked in advance. The views from atop the peaks and ridges above Taos Ski Valley are the most beautiful on the planet, says Big Al, chief (and only) tour guide, mechanic, and resident cowboy of Big Al’s Wilderness Adventures. “It’s a personal opinion,” says Al, but he’s well qualified to offer one—he’s visited 54 other countries and 49 other states. Infatuated with northern New Mexico’s pristine beauty, Big Al spends every winter day sharing his beloved valley with visitors. Everyone in the family can participate in Big Al’s snowmobiling adventures, which begin in Taos Ski Valley, about 90 miles north of Santa Fe at the end of N.M. 150, near Wheeler Peak, and, after two hours of cruising the snowy Southern Rockies, finish off with inspired minds and rejuvenated spirits. The tour destinations reach elevations of 12,000 feet and include broad views of Baldy Mountain, Eagle Nest Lake, and hundreds of miles in every direction. Big Al says the light just before sunset, when the temperature is dropping, allows a person to see individual needles on a tree two miles away, and make out each tiny juniper miles in the distance. The goal of every tour, he says, is to inspire people. One particularly lovely part of the trail is named “The Hand of God,” after one visitor’s enchanting experience there. Weekly, guests exclaim, “This is so beautiful!” Big Al agrees, but tells them the landscape is even more spectacular when shared with friends and family.—J.O. • Big Al’s snowmobile touring season begins on Thanksgiving and runs through the second week of April. Visitors must make advance reservations by calling (575) 751-6051. Adventures last two hours, include warm clothing, and sell out quickly during school holidays. www.aataosskivalleywildernessadventures.com. Chama Valley’s 10 kilometers of ungroomed cross-country ski trails are ideal for an adventurous family outing. Skiers must cut their own paths on these pristine trails, which are located at Windy Point, 12 miles north of Old Town Chama on N.M. 17, and just across the Colorado state line below Cumbres Pass. The trails serve as an excellent introduction for children new to the sport. For thrill seekers looking for more rugged adventures, Chama also provides light backcountry skiing. To get ready for a backcountry trip, be sure to have cold-weather gear, layered clothing, and the right ski equipment. Backcountry skis—similar to Alpine skis, with twin tips and full metal edges—typically have stiff boots and bindings that attach in the front and back. (Cross-country skis, which are long and thin, have soft-shell leather boots that attach only in the front.) So the kids can come along, too: strap them into a chariot chassis and pull them behind an adult skier. And during your excursion, stay overnight in an affordable hut or yurt. Those looking for an organized but still untamed excursion can look forward to the annual Chama Chile Ski Classic, held on Martin Luther King Jr. Day weekend (January 17, 2010). The weekend races are tailored to people of all ages and abilities, with routes from 5 to 10 kilometers; beginner and noncompetitive skiers can enjoy a groomed, 1-kilometer loop.—J.O.